Who doesn’t like waking up to a little smile to start the day? Or in this case, quite a few smiles courtesy of Bing and Cortana. The digital assistant is showing off a classic fairy tale using nothing but emoji and is tasking you, the user, in guessing what the fairy tale is. You can also tweet the answer right to Twitter as soon as you figure it out. So how can you get to this new feature? 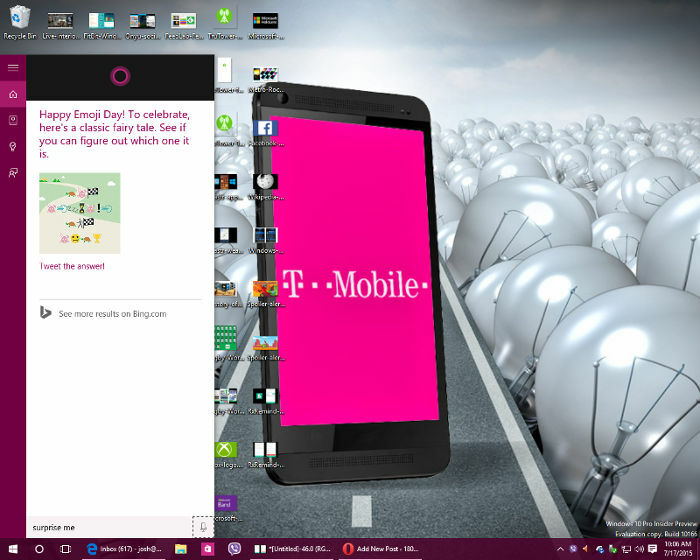 Simply open Cortana by tapping the “search” button on your Windows Phone or Windows 10 PC or tablet and say or type “Surprise me” to get to the screen similar to the one above. July 17 is celebrated as World Emoji Day due to the date being used as a generic date on many emoji already. It’s an interesting addition to Cortana that is sure to especially make people using these social apps happy.